need some help choosing a new gun. I was looking at the G&P Sentry Magpul Long Barrel. G&P sentry will be a good choice. Anything from G&P and G&G is a good bet. G&P will have better externals though. 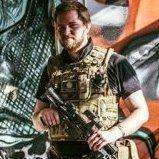 Agreed but also note G&G Also do a Hk 416 (called t4-18 - http://www.proairsoftsupplies.co.uk/acatalog/gen_2_t4_18.html ) - Which are amazing, Full Metal Body Ofc, it has locking dust cover, working forward assist, and G&G pneumatic blow back system - which imo is best blowback system (bar gas blow back) as it uses a second piston to operate - which means if the system ever fails it doesn't jam the gearbox like mechanical systems and doesnt drain your battery like electric systems. With regards to G&P, Sentries are nice, But Im a Big Fan Of The G&P Magpul Moe M4's - There Amazing. I have a G&G T4-18, great gun. 325fps out of the box, good ROF, solid and very reliable. In the £300-500 range the best M4 going performance wise is the Tokyo Marui M4A1 SOCOM Recoil Shock, there's absolutely nothing else close. Though if you want to hang all sorts of accessories off a RIS foregrip you'll have to splash out a bit more to replace the handguard. That said, for range, accuracy and reliability out of the box I doubt you'll find anything better anywhere. For £3-500 I'd recommend building yourself an M4. Buy a nice cheap base gun, stick a couple of upgrades in it to get it firing nicely, then blow the rest of the budget on getting it to look ridiculously unique! I'd just get an ICS either with or without RIS. I personally wouldn't be too fussed about getting any external parts other than RIS add-ons and optics, so the fact that ICS have bad compatibility with body kits, grips, barrels and that sort of stuff wouldn't bother me. The guns are solid, they shoot nice, they're high quality, they're the easiest M4s to work on by a country mile and they have the heft and strong build of a real one to boot. Additionally, the internals are spot on in general, I wouldn't even bother doing anything substantial to the gearbox, just stick a tightbore in it, new hop, maybe a new nub. Shim the gears, regrease the box, potentially swap out the motor and you've got a A* fantastic M4. Seriously though, ICS guns are usually pretty sexual out the box! With that budget,you can get yourself a top of the range VFC HK 417 which are basically fancy M4s,with great performance,build quality and a sweet externals. I had the pleasure of using one at a game,great gun,and really fun to use. Does it have to be brand new? How about a TM recoil?